Using the patented Fastbind Stripes with the Fastbind BooXTer series binders, you can easily make inexpensive soft cover books with a strong & secure binding. In the finished book the binding staples are covered with an elegant adhesive stripe that wraps around the spine, giving you a professional look each and every time. Stripe binding is quick, easy and inexpensive! You can make soft cover bound photo books in minutes, and these low cost products can give you an edge when promoting your photo book business! You can make the cover from the same material as your content, printing everything at once, or you can print the cover separately on thicker paper. Used as your low cost offer or as a promotional give away, these soft cover photo books round out your photo book product line at a very low cost! 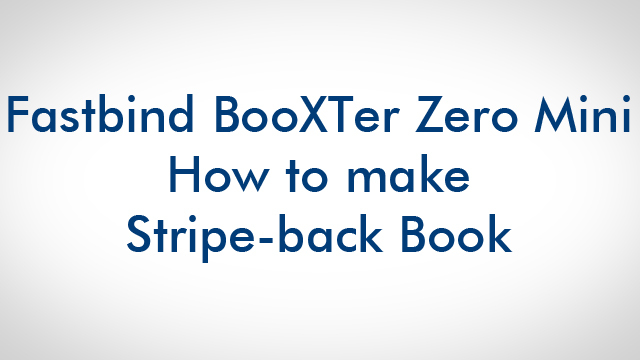 Place the stripe in front of the book block in the BooXTer binding system. You can create an elegant strip-back book using the entry-level Fastbind Zero Mini. Place your content, including the front and back covers, on the device. Place a BooXTer stripe on the front, leather side down with the foamy grey area towards the spine, as shown in the clip. Hold the block in place with the special positioning magnets. Staple your book. Then, you just need to peel the stripe off and fold it over to cover the staples. The result is very elegant book. Fastbind BooXTer stripes are available in A4 portrait and landscape, and A3 portrait.